Highsec is a special place in the EVE galaxy. Its unique qualities--chief among them its Code--absolutely must be respected. I think most people understand this. As for those who don't, a terrible fate awaits them. But don't take my word for it--just look at these kills from the week of January 15th @ 00:00 EVEtime through January 21st @ 23:59 EVEtime. Olga Miagkih was torn. She was too lazy to divide her cargo, but she knew it was unsafe to pack 18.6 billion into a single ship. 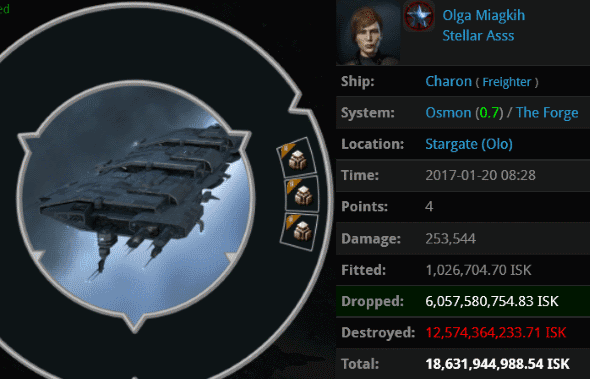 So Olga triple-bulkheaded her freighter, seeking refuge in the multiple EHP buffs that CCP has given her kind over the years. Agents Hayley, Nin Rin, Miner Compliance Officer, Mr Cellophane, Logical Fallacy, Ido Adudu, eC Cade, Skiff Poddington, ZAKURELL0 LINDA, Darnoth, Dewzer Eyre, Hulk Poddington, Logical Fatality, Prixm Wind, Mack Poddington, Pure Whyte, Lawrence Lawton, James Poddington, Another ShadeOfWhyte, big brutor three, Yvain Bluewater, big brutor four, Morrigan Laima, Yuliana Tang, Sorg-frae, Circo Maximo, Zoe Worclaw, Mon Mothmaa, and Dross Kusoni, empowered by the Code, were more than capable of overcoming her ship's hitpoints. Truth be told, it was a perfectly miserable week for Code-violating freighter pilots and their "friends" in Anti-Ganking. Enraged by the carnage they saw, they tried to console themselves with the thought that at least the Kusion family was nowhere to be seen. Drekonia was dumbstruck when a massive gank fleet fell out of warp all around his freighter. Actually, he was dumbstruck when he returned to his keyboard, which was likely well after his freighter died. But you get the idea. Forty-four gankers, including the Kusion family, showed up for the fight: Agents Logical Fallacy, Yvain Bluewater, Jayson Kusion, Skiff Poddington, BoneyTooth Thompkins ISK-Chip, Hulk Poddington, eC Cade, Bob Painter, Norrec Lafisques, Mack Poddington, Jeremiah Kusion, Git Guud Nurd, Joseph Kusion, Jackson Kusion, Eugenie Brazier, Nin Rin, Morrigan Laima, Jayden Kusion, big brutor two, Prixm Wind, Jake Kusion, Hayley, James Poddington, Turkey Baster, Dragalis Miraxim, big brutor one, Lich Terminus, Johnathan Kusion, Darnoth, Lawrence Lawton, Ricki Lake Show, Sorrento 655321, Liz Cadelanne, Logical Fatality, Inspector Implant, Miner Compliance Officer, Unwarranted Assumption, Pure Whyte, Joshua Kusion, Joel Kusion, big brutor four, Justin Kusion, big brutor three, and ZAKURELL0 LINDA. 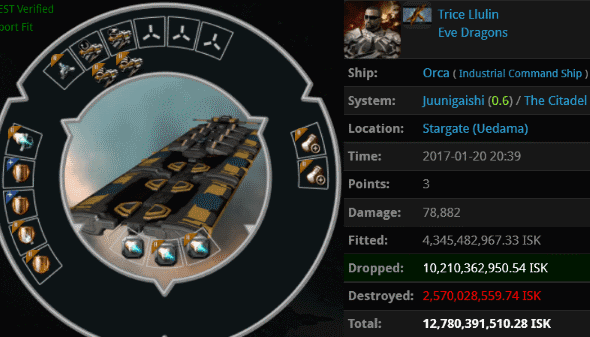 Speaking of EHP buffs, Trice Llulin's Orca was nothing less than a celebration of its pilot's arrogance. 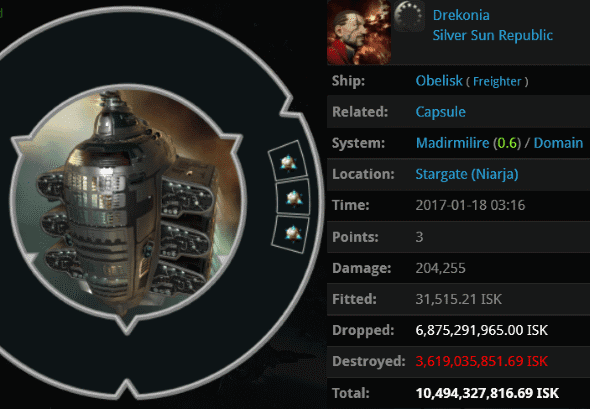 It, too, fell prey to a massive gank fleet; Uedama and Niarja were both theaters of death and destruction this week. Agents Logical Fatality, Nin Rin, dAbOsSlAdY77, Miner Compliance Officer, Justin Kusion, Jayson Kusion, big brutor three, big brutor four, Hayley, Prixm Wind, Unwarranted Assumption, Logical Fallacy, Yvain Bluewater, BAE B BLUE, Darnoth, Joshua Kusion, BAE B PEW, Gea Stormbound, Mark Ormerant, Collateralized Contracts, Urban Worrier, Jet Set Milly, Perlo Tissant, Jake Kusion, Jeremiah Kusion, Joseph Kusion, Joel Kusion, Jayden Kusion, Turkey Baster, Johnathan Kusion, Jackson Kusion, Unfit ForDoody, Masrok VII, Dragalis Miraxim, Ruby Dubes, Wylde Ranger, Kill-Chan, and Liara Iwaira tore through the Orca and got 10 billion in dropped loot. As for the Orca pilot, he was left with nothing but a profound sense of regret. Omaticaya, suitably frightened by the sight of so many freighter wrecks, decided to use a speedier, slicker courier ship. Then he activated its autopilot and went AFK. Agents Le caneloni sauvage and kellya were on hand to deliver a surgical strike. 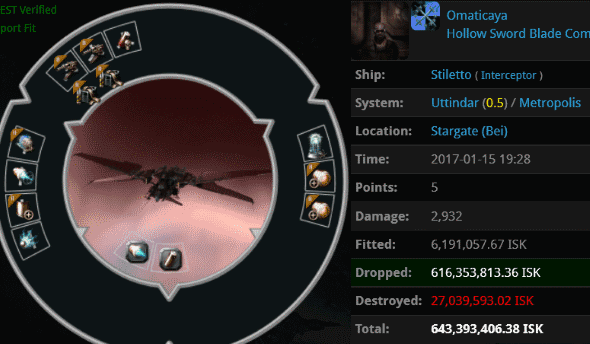 Skills belong in an EVE character's head, not his cargohold. 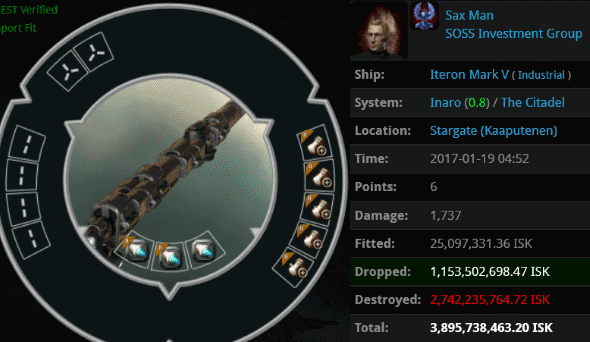 There's more than one way to lose 3.8 billion isk in highsec, and Sax Man chose one of the worst. He was only interested in using fitting slots that allowed him to reduce his ship's hitpoints. Trimmed down to a svelte 1,737 hitpoints, the Iteron Mark V was now ready for its date with Agents Votre Dieu and Narl' Amhar. 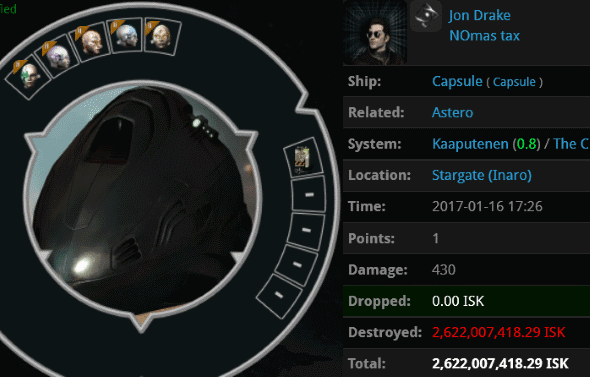 Jon Drake was deceived by the carebear fantasy that you'll never lose your pod as long as you stay in highsec. Agent Pod-Goo RepoWoman showed him the truth: A pod's safety is entirely dependent upon one's obedience to the Code. When it came to Code-compliance, Jon Drake fell short. In the end, his implants were good for nothing but producing a 2.6 billion isk killmail. That's a lot of CODE win, and you know what that means. Wow, Erika/Erich Einstein has no qualms about humiliating himself. He needs to calm down and buy a permit. The totals in this weeks kills add up to more than the collective tallys of antiganking since 2012. Man when they fail, they fail hard. Just think about 10bill in one freighter kill for a sec. Thats enough to buy codex biovectors skill injectors in that one gank. WOW he must be crying at that lossmail.